The nifty closed at 4297, gaining 48.90 points on weekly basis or about 1.15%. 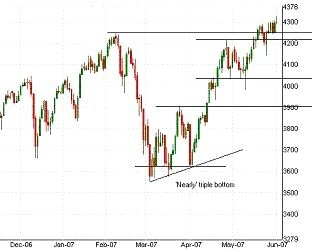 Between 1st March and 11th April a nearly ‘triple bottom’ formation could be seen in the daily chart of nifty. This is a highly bullish sign and the index has managed to close above its previous all time high of 4245. Having said that, attempt was made by the bears to push the index down immediately after the index closed at 4278 on 22.05.07. One can notice the ‘bearish engulfing pattern’ there, but it is of little significance since the index broke the resistance on a closing basis. Immediately bulls were seen in action and index once again closed above 4245. This indicates that the bull run is not yet over. Correction, if any will be a good opportunity to enter the market. As I said in my earlier article, Nifty is likely to reach 4600 soon. Support levels for the nifty are 4218 and 4039. The engulfing pattern seen at the top of the trend on 31.05.07 is not a helathy sign. It was further confirmed by the sell off next day, with a very long upper shadow. We can anticipate a correction now upto 4039 or 3902. 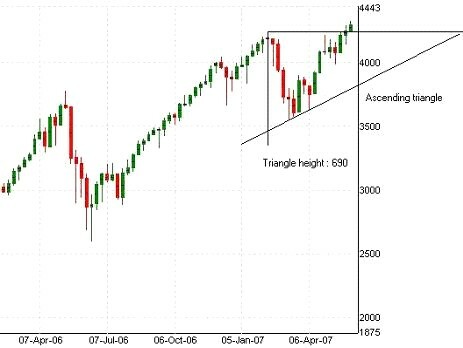 However, the weekly chart shows that there is an ascending triangle breakout with a triangle height of about 690 points. This when added to 4245 gives a target of 4935. We can see from the charts that Nifty is bullish right now. It can be seen from the above table, on a weekly basis bulls have the slightest edge over the bears. Though index is bullish, cash stocks have performed quite differently. SREI Infrastructure Finance Limited has been bullish since 23.04.07. After hitting a high of 66 on 16th May the stock tested its support levels at 60. When it closed below 60 a “piercing line pattern” was formed. From 58, it managed to close at 86.30 or about 48.79%. I have very often seen this candlestick pattern yielding very good results, provided it is formed at the right time. Helios And Matheson Information Technology Limited formed a “double bottom” around 124.35. Piercing line pattern was formed on 25.05.07 with 127.05 as close. The next Friday, stock hit 20% upper freeze and closed at 170.50. 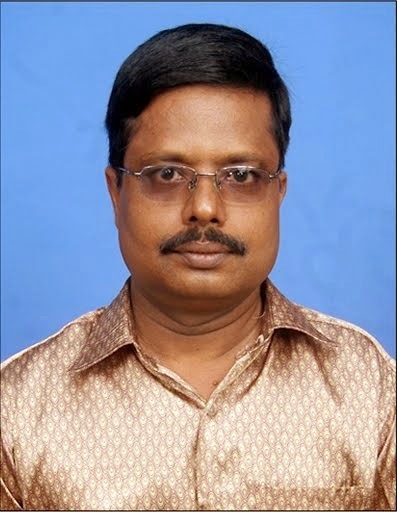 Abhishek Mills has been bearish ever since it got listed on 19.03.07. Bearish engulfing pattern was formed in Torrent Power Limited on 29.05.07 which was confirmed by further lower close and a red candle. The stock lost about 11.28% while failing to close before its previous high. Nifty continues to be in overbought zones in weekly charts. However, it is normal for a scrip to be like this during a bull market while in bear market it is normal to be in oversold zones. As such there are no reversal signs in daily or weekly charts and let us hope for the best next week. In the next article we will discuss some technically interesting stocks for the short term.